Bags under the lower eyelids are usually a combination of fat protrusion and excess (saggy) skin. Unfortunately a dermaroller cannot fix fat protrusion, neither it can fix receding fat tissue (hollow spots). A dermaroller can thicken the skin and it can slightly tighten the skin but it cannot affect adipose tissue (fat tissue). If you roll under your eyes, be careful: When you put your finger under your eye, you'll feel a bone. Do not roll closer to your eye than where that bone is. Pull/stretch your skin downwards from the eye with your other hand and roll it with the other. Fillers such as Restylan injected into the grooves below the bags will make those bags much less prominent. The fillers will last up to a year and then have to be re-injected. Also, autologous fat can be used to fill the hollow places and grooves. Or you have to get a lower blepharoplasty. They will remove the excess skin, reposition the fat etc. Whatever you do - choose your surgeon carefully. If you swab them with some alcohol before you start needling, then as long as you don't store the needles in a contaminated place (bad places are a kitchen sink or on a washing machine next to a WC for ex.) you can just put them anywhere you like, as long as they lie horizontally. Indeed best would be to keep their original wrapping and put them back in after they've dried. Dermarolling / Microneedling / Confused about topicals after dermarolling..
Vit. A is fat soluble and it is OK to apply it on oily skin. You can even mix your baby oil with Retin A in your hand palm and use it after the shower as usual. The idea is to stimulate the skin. Autologous blood injections are mainly used to enhance healing in places that do not have ample blood supply such as the tendons. Needling or rolling the skin will increase blood flow to the skin and that blood will bring in the growth factors. Scars or stretch marks also have a limited blood supply so this is very beneficial. Needling might even lead to revascularization of the scar tissue. You can certainly use the same roller. If your routine helps in the face, it will be be useful other places too. If you want to trigger collagen in the dermis or if you feel that the 0.5 mm roller did not make enough of an improvement, you should also use a 1.5 mm dermaroller every now and then. Apply vit. C on your decolletage and thighs as well and protect it from the sun. It is important to expect realistic results. If you expect miracles, you will be disappointed. A dermaroller cannot make you look 15 years younger or make your skin totally flawless. It can make lots of improvements and partially slow down skin aging but you have to be realistic. The skin gets red after rolling so it may be difficult to spot the individual stretch marks or scars, especially if you vigorously roll with long needles as many of our customers do. If you roll and needle at the same time there is a slightly higher risk of infection. I can never be sure how big the rolled areas are that our customers roll and single-needle and I do not recommend doing large areas in one go. Some customers told us they use EMLA but only for needling scars, not for dermarolling. Emla should not be used on open skin. The producer states this in their user manual and for safety reasons I must recommend following these instructions. because if you needle the skin first and ten use Emla for needling scars then Emla is used on needled (open) skin. Some of our customers first needled their stretchmarks and then immediately rolled the whole area with a 1.5 mm dermaroller and they complained that rolling over needled patches was really painful. I'm currently digging into the subject of cultures of autologous melanocytes and their transplantation into hypopigmented scars. I would like to try the single needle for “transplanting” melanocytes from healthy skin to skin where there are no or almost no melanocytes (such as stretchmarks and other hypopigmented scars). Dermarolling / Microneedling / Tx Roller - how long are the needles? I just had a look - they do not say what the needle length is. That site is one of those typical ripoff sites, absolutely great graphic design but no vital info and outrageous price (118 USD). I guess the world belongs to the bold. "Equipped with over 90 stainless steel micro-points to stimulate the release of stress, tension and toxins." This is incorrect. Dermarolling does not improve toxin levels, stress or tension. I wish I could claim this on our site and sell more dermarollers..
You can use vit. C after rolling with a 0.25 mm, provided the burning feeling is not too strong because vit. C (ascorbic acid) is acidic. It depends on how strong the concentration is. Some people can handle combining vit. C with 0.25 mm and some can't. blood to the skin which is useful. 9 parts of water and 1 part of vit. C makes roughly a 10% vit. C solution. Make sure the crystals are fully dissolved - you don't want one in your open skin..
You can also use a measuring cup (that comes with laundry detergent for example). 1) Increased pigmentation of the skin (brown colored dark circles), being quite common in darker skinned individuals. Or melasma, or sun spots. 2) Skin thinning. The underlying tissue such as veins and the orbicularis oculi muscle shine through as bluish, reddish or purplish tones. In addition, because there is not much fat between the skin and the muscle, the dark muscle absorbs the light and that makes the area darker. 3) Loss of fat in the area below the eye, making the area hollow and shadowy. 4) Shadows created by lax tissues, bags under the eyes etc. 1) Bleaching creams such as hydroquinone or mild acid peels. Do not use Tri Luma since it contains a steroid and that might thin the skin even further. Tretinoin cream. Fillers. 2) The skin can be thickened by a dermaroller and the skin laxity improved. Using Retinoids may help thicken the skin as well. Using fillers such as Restylan or fat grafting will help. Make up concealers help. 3) Fillers such as Restylane or grafting your own fat tissue. This area is very tricky to use fillers on so choose your doctor carefully. 4) Plastic Surgery and/or fillers. Whatever you decide, you should always use homemade vit. C serum on that area. Vit. K supposedly breaks down hemosiderin but whether the circles are caused by hemosiderin deposits is not confirmed. You can try vit. K creams with a 0.20 or 0.25 mm roller. I have suffered from severe acne in my earlier teenage years; as a result, I can see red blotches under my skin on my face, probably as a result of inflammation and acne scars. Taking hot showers and having a bad diet (sugars and highly processed) also probably contributed to the problem. The red blotches are prevalent all around my face, but from far away you may not notice it. Adding to the that redness problem, I have broken capillaries around my nose and above my chin areaSo my QUESTION is: Will using the 1.50-mm roller in a proper manner and intervals reduce or diminish (completely over time?) the redness on my face by thickening the dermis and/or enhancing the healing of the red blotches? A dermaroller speeds up the skin turnover and that should help diminishing the red spots caused by acne. Whether they will diminish completely is impossible to know. If those spots are due to hundreds of tiny broken capillaries then having vascular laser treatment would be better. Since you described the spots as "under the skin" it looks like they might indeed be capillaries. Or should I save money for a series of Intense Pulse Light treatments? It is very difficult to judge because I do not know what is the cause of these blotches. The best is to make an appointment with someone who performs vascular laser treatments or a dermatologist and they should be able to tell you the cause of your redness. Or Fraxel? But then, again, the derma roller theoretically should yield similar (but perhaps less dramatic results) as Fraxel. Fraxel works similarly to dermarolling. It makes tiny holes in the skin and our body will quickly fix the holes by filling it with new skin. A vascular laser works differently. Capillaries and vessels transport red blood cells, containing hemoglobin. Certain Laser or IPL wavelengths are absorbed by hemoglobin. In the hemoglobin, this absorbed light energy is transformed to heat and that leads to the thermal destruction of the capillaries. What ingredients should I be looking for in a product to help reduce the redness problem I have under my facial skin? If they are due to acne, start using homemade vit. C serum and a 0.5mm dermaroller. The taper is so small to be nearly invisible. The actual needle is only about 2 mm long, and its taper is perhaps 0.5 mm long. The thick part is an intermediate "bar" and should not go into the skin. It is a safety feature to prevent the needle from going too deep. So no, the thicker part is not supposed to go in. Dermarolling / Microneedling / Dermarolling fresh surgery scars? When stitches have been removed, follow the instructions of your surgeon for the "scar management". It usually involves pressure massage. Every day you'll apply pressure with your fingers onto the scar for approx. 20 seconds, spot by spot. A scar typically has reduced blood circulation and applying pressure will expel deoxygenated blood, allowing fresh oxygenated blood to flow in. This pressure will thus mechanically prevent the formation of a hypertrophic/raised scar. Sometimes the special elastic bra that is worn after surgery is designed such that it applies pressure onto the scar. The scar will improve significantly during the months after surgery. The dermis will heal in about six to eight weeks and then it can take up to two years for the scar to fully mature. The most targeted way to treat surgical scars is single needling.You should wait eight weeks after the surgery. Start gently! Your surgeon may use a vascular laser to help reduce the redness of the scar. The redness of the scar is caused by inflammation and dilated blood vessels. If you want to speed up the reduction of the redness, you can try applying anti-inflammatory creams. You have to ask a pharmacy for nonsteroidal anti-inflammatory cream or gel.Those are normally used for arthritis. Anti-inflammatories are for example Diclofenac, Ibuprofen, Aspirin (notParacetamol). Or buy NUROFEN rapid capsules or NAPROXEN capsules and pierce them. They both contain a nonsteroidal anti-inflammatory subtance. You can also try diluted Tee Tree Oil but just like other essential etheric oils, it can irritate the skin in some individuals, especially if not diluted. It is an antibacterial and anti-inflammatory. Redness makes the scar very visible but on the other hand, if there is still a lot of blood in the scar, it means the scar is still "active" and there is more likelihood that needling will slightly shrink its size. (Needling will actually make the scar temporarily more red but this will subside). Dermarolling / Microneedling / Smile lines, can dermarolling help? Do you mean the fold running from the nose to the corners of the lips? Wash it off before you roll. Dermarolling / Microneedling / The Barbie drug (Melanotan) and dermarolling? Our pituitary gland produces MSH – melanocyte-stimulating hormone. This hormone stimulates melanocytes in the skin to produce and release a pigment called melanin (that's how we get tanned). Melanotan (the so called "Barbie drug") is a synthetic form of this hormone. Melanotan (it hasn't been approved yet) will make your skin tanned (without the need for sun exposure). I think you can safely roll when using melanotan, but since it hasn't been officially approved, I can't on the record recommend using this hormone at home. The reason why stretch marks (and other scars) do not tan or won't tan much is because scar tissue usually doesn't contain melanocytes (you might achieve melanocyte production in stretchmarks by needling). Melanotan will likely increase the contrast between the white stretchmarks and the skin because the skin will get tanned while the stretchmarks will not - or not as much as the surrounding skin (unless they contain melanocytes). If sun exposure makes the contrast between your stretchmarks and the surrounding skin more prominent then melanotan will very likely do the same. any bleeding so that you just get a tingly feeling - and it's not painful. Question - How much pressure do you use ? in the skin by the depth of the needle - causing obvious pin point bleeding? Clearly painful though. advise and say you can do 3 times a week ) Isn't this a waste of time? it wrong as it would be too painful. I'M VERY CONFUSED as your site says for example use 1mm roller once every 2 weeks approx. Skin is very tough because it is our protective layer. It is not easy to penetrate the skin, especially not with many needles in one go. You can make penetration easier if you soften the skin by taking a hot (steam-) bath prior to rolling. You should put moderate pressure on a dermaroller. Not too much and not too little. If you do not put any pressure on the roller then the needles only go superficially and you can roll more frequently. I would compare it to tooth brushing – too much pressure is not good and too little is not efficient.. The thickness of the skin (epidermis + dermis) is about 0.3 mm on the eyelids, 1.5 mm on the thigh, 1.8 mm on the back and over 2 mm at the soles of the feet. It varies depending where on the body it is and it varies between individuals as well. Furthermore, men usually have thicker skin than women. A 1.5 mm roller penetrates about 1.3 mm into the skin, when applied with sufficient pressure. These varying skin thicknesses are responsible for the fact that some of our customers have pinpoint bleeding on the face with a 0.5 mm roller and some do not get any pinpoint bleeding with a 1.5 mm roller on the face, not even with a lot of pressure. That is why it is very difficult to give general recommendations concerning the needle length etc. - even assuming that all customers use the same rolling pressure. The dermaroller's patent holder doesn’t produce dermarollers longer than 1.5 mm and they state that needles longer than 1.5 mm are contradicted. Their patients do not get faces full of blood, just occasional pinpoint bleeding. That is what you get with a 1.5 mm roller. You'll see more blood spots if your roll with 1.5 mm on thin skin such as that of the neck. Studies showed that the collagen induced by rolling was not deposited deeper than 0.5 mm. Some surgeons use dermarollers with 3 mm long needles (those "bloody" YouTube videos are from rolling with needles longer than 1.5 mm and they cause a bloodbath) but there is no evidence that those work better than 1.5 mm rollers. This is not our theory - this is what the Swiss dermatologists who patented the Original Dermaroller say on their own website. And they sell exclusively to clinics and other professionals. 3 mm rollers are unsuitable for home use since they carry the risk of infection and nerve damage. We think that those rollers are a marketing gimmick, intended to persuade people not to home-roll but to pay through the nose for a "bloody treatment" instead, because that would be somehow be "better". Your goal is to produce collagen in the dermis. A 1.5 mm roller will reach the dermis. That is all you need. The epidermis has no blood supply. The dermis has irregular, small and relatively sparsely distributed capillaries in its upper part and a denser network of larger capillaries in its deeper part. We sell a 2 mm dermaroller for thick skin areas such as the stretchmarks on the back or the buttocks. We also now sell a specially designed single needle for targeted intensive needling of specific skin problems such as acne scars, stretchmarks, surgical scars, wrinkles etc. You will get more pinpoint bleeding with this targeted needling, but the results are worth it. There aren't many ways to rejuvenate or remodel skin. One of the best methods is to cause mild skin damage. Our body will renew/remodel the skin by fixing that damage. That is one of the principles of dermarolling. That is also the principle behind most laser rejuvenation treatments. A Laser either evaporates the entire top layer of the skin or it evaporates only fractions of the skin (Fraxel laser). Our general recommendations are always on the safe side. If you are a male with thick skin you can roll more frequently. 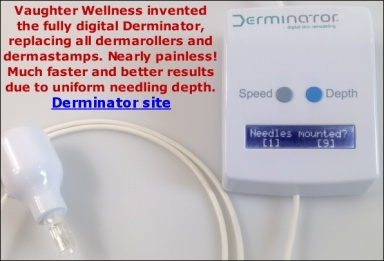 The patent holders of the Dermaroller say that the smallest permissible interval to roll with long needles is six weeks. The longest needle length roller they manufacture is 1.5 mm and the longest needle length they sell to private individuals is 0.2 mm. So there is no concensus amongst experts, and our seemingly conservative interval guidelines are therefore considered liberal by their experts. If you're a woman and you roll your neck then you should roll once every two weeks. I am just trying to explain that it is impossible to give general recommendations that would ideally suit every single area of the skin, every single skin problem and every single individual. You have to adjust based on your unique situation and the general guidelines we supply.